Book the church where you wish to marry. (Contact Fr Ger to arrange this.) Weddings can be arranged for St Finians or Our Lady of the Valley. Book the priest who has agreed to marry you. Check that he is officially registered as a Solemniser by the Irish State, if not our Parish Office will advise and help you on the required procedure. The national list of Solemnisers can be downloaded as an Excel spreadsheet here. Give at least 3 months’ notice (preferably more) to the priest in charge of the area or Parish where the bride lives. Each person must complete the Pre-Nuptial Enquiry Form with the priest of the Parish where he/she resides. As the bride’s Parish Priest has responsibility for the wedding paperwork, his name will be needed by the Parish Office. Proof of Freedom to Marry – normally Letters of Freedom from previous parishes of residence, but other forms of proof may be accepted. 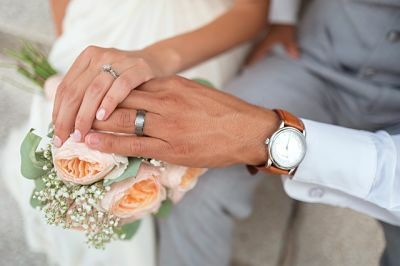 If previously married or Non-Catholic, permissions and dispensations need to be applied for through your local Parish clergy who should be contacted when the wedding booking is made. The amount of the offering to the priest is at your own discretion. The musician/singer will advise you on appropriate music with reference to the Kerry Diocesan guidelines for wedding music. The priest should also be consulted. Secular songs are not appropriate for the wedding liturgy. a. Meet the Civil Registrar at least 3 months before the wedding stating your intention to marry. b. Receive the Marriage Registration Form (MRF) from the Civil Registrar. c. Bring the (MRF) to the Solemniser (Priest). e. Return the signed (MRF) to any Civil Registrar not more than 1 month after the wedding.